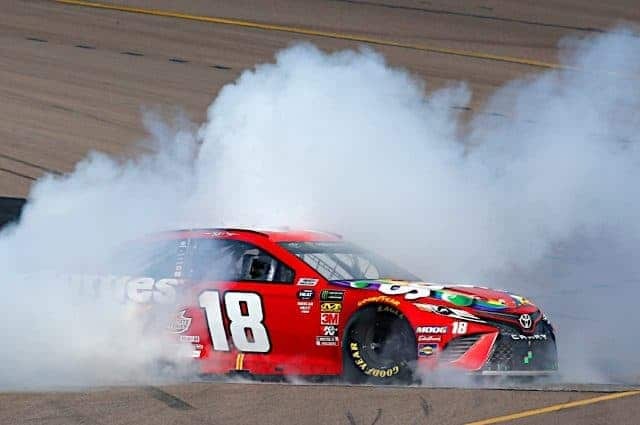 Something seemed a little off at ISM Raceway on Sunday. In an otherwise fairly typical race, one competitor was noticeably absent from the front of the field. In the last decade or so, Harvick has become the most frequent winner at the 1-mile flat track in Phoenix. He has collected nine wins in 33 starts, the most of any Monster Energy NASCAR Cup Series driver. Harvick’s record of success at ISM has made him what Jimmie Johnson is to Dover International Speedway, what Darrell Waltrip was to Bristol Motor Speedway, what David Pearson was to Darlington Raceway and what Richard Petty was to Martinsville Speedway. Harvick’s mastery of ISM may have started in his final years with Richard Childress Racing, but his move to Stewart-Haas Racing in 2014 put him on another level. After taking the wheel of the No. 4 car, he went to Victory Lane in four of his first five visits to ISM. He might have gone five-for-five if rain had not washed out the remainder of the fall 2015 race, securing a final Cup victory for Dale Earnhardt Jr. Even when Harvick has not been able to win at ISM, he’s been close. Until Sunday, he had never finished worse than sixth there in an SHR car. A run of 10 top-six finishes in 10 races is almost unbelievable, but Harvick always found a way to make it work. Maybe that is why it was so surprising to see Kyle Busch dominate Sunday’s race instead of Harvick. ISM never used to be one of Busch’s strongholds. He earned his second career Cup victory there in 2005 but did not win in Phoenix again until the fall race last year. That race was supposed to be a corrective weekend for Harvick, who had won the week before but had been penalized for an illegal spoiler modification. With its free pass to the championship raced revoked and crew chief Rodney Childers suspended, the No. 4 team was only three points above the playoff cut line heading to ISM. Harvick and SHR needed a win, but they were heading to Phoenix, after all. Who didn’t expect them to win? Instead, Busch came out on top. Harvick led the opening run of the race but had to pit shortly before the end of the first stage for a flat tire. He never led another green flag lap after relinquishing the lead. A few late-race incidents took out most of Harvick’s competition for the final tickets to the championship round, and he still wound up advancing even without the win. But it was still surprising to see Busch come into Harvick’s house and walk away with the trophy, especially in a race that had a serious influence on the championship fight. On Sunday, Busch was even more dominant, leading 177 laps on his way to victory. The last time a driver other than Harvick led that many laps at ISM and won was when Johnson claimed victory there in November 2009. To Busch’s credit, he and crew chief Adam Stevens have performed very well together at several tracks where the No. 18 team always used to struggle. ISM may be nearing the top of that list. Meanwhile, Harvick failed to lead a single lap all race. That is not unprecedented in his previous starts at Phoenix with SHR, but his top six streak did come to an end with a ninth-place finish. While plenty of drivers would be happy with those results, Harvick battled through a race of slow pit stops and a car that just couldn’t quite keep up with the frontrunners. Perhaps the moment of truth was when Harvick took two tires during a caution period with 90 laps to go, vaulting him to third place. Now with the leaders in sight, Harvick was in position to make his move. However, he got jammed up on the restart and lost a lot of track position before NASCAR threw another caution for Ryan Preece’s crash. Harvick hit pit road again for fresh tires while most of the field stayed out. While Busch was chasing down Ryan Blaney for the race lead, Harvick had to claw his way through the pack just to get back to the top 10 by the time the checkered flag fell. That said, Harvick’s lack of speed relative to Busch cannot be completely explained away by pit road woes or bad luck. Busch had more speed than anyone over the long run, and if Harvick and Childers had been more confident in their car, they probably would not have resorted to the two-tire strategy in an attempt to leapfrog Busch. The point is that Sunday’s race suggested that Busch has closed the gap between himself and Harvick at ISM. Busch cannot threaten Harvick’s overall record in Phoenix at this time, and Harvick will have plenty of other opportunities to pick up wins before the playoffs begin. But there is no longer such a solid guarantee that Harvick will be the fastest driver at ISM the next time NASCAR shows up to the track. Competitors may start looking to the No. 18 instead of the No. 4 as the team to beat. Busch and Harvick are both likely to be part of this season’s championship battle. If the two drivers are still in the game when NASCAR comes back to ISM in November, the power dynamic between them will be different. Busch’s growing ability to match Harvick’s skill at Phoenix could play a major role in determining who walks away with the checkered flag, and the title one week later.